Are you getting beat? It’s a simple question whose answer consists of either a confident “No,” or the defiant, “Yes, but…” that’s littered with excuses. To be clear, the response is a one-word answer. If your answer isn’t the one word you’d prefer, there may be a number of reasons why. One of the primary reasons may be the #1 ranked challenge that 4,700 global executives stated: innovating to achieve competitive differentiation. Unfortunately, not having “lots of differentiation” usually means not having lots of profits. A study of 108 business launches by companies showed that 86 percent were merely line extensions, which only accounted for 39 percent of profits. However, the 14 percent of business launches that brought differentiated value to customers accounted for a whopping 61 percent of profits. This ability of a manager to create differentiation customers value is a subset of the skill of strategic thinking. In announcing the hiring of an outsider to run their critically important consumer business, Johnson & Johnson CEO Alex Gorsky said, “Sandi Peterson is an experienced global leader known for her strategic thinking and proven track record in growing businesses.” Since the number one priority for CEOs is business growth (Conference Board Study, April 2011), it makes sense that J&J would want a strategic thinker, someone skilled at generating insights that lead to new value for customers and new profits for the company. 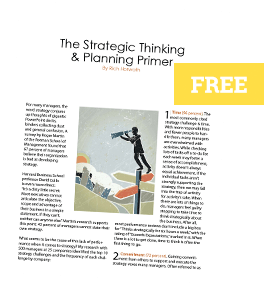 Whether it’s products, services, or people, strategic thinking drives the differentiation that matters. The question for you: Is your team strategic enough to win the day?